* ECSTASY DISTRIBUTORS. Police who released a chart showing personalities in a "distribution channel" for Ecstasy party drugs in Metro Cebu did not use the word "syndicate" or "gang" for the group. Details about the "channel" are sketchy and sparse. The numbers though are specific: 15 members, including the leader, the "Big Boss," described as a "young woman." Five of the members are women and 11 were already arrested. Which left only four at large, unless they recruited new members the police still don't know about. Interesting items in the chart: Some members are tagged "lovers" while others are "friends." Kenneth Dong, supposed to be the big-name personality, being a club owner before he was arrested, was a mere distributor. And yes, thanks to the creativity of the designer who made the chart, it looks spooky, though harder to read, because of the pile of skulls on which text is sur-printed. 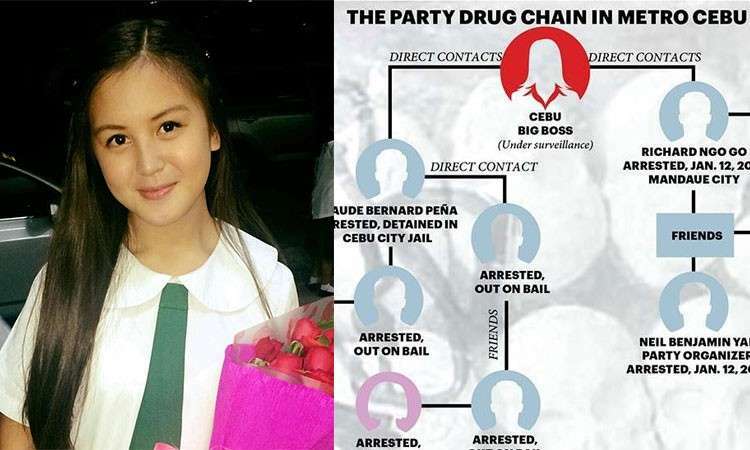 Promptly taking the cue from President Rodrigo Duterte, police are scrambling to get evidence against Nel Spencer Tiu, the boyfriend of Ashley Abad, 19-year-old nursing student who died of alleged drug overdose after a January 19 pre-Sinulog party in Cebu City. They are warning Tiu that if he wouldn't heed summons from the police, he might be arrested and charged. Bureau of Immigration and Justice Department, also driven by Duterte's interest in the Abad tragedy, made initial moves to have Tiu barred from leaving the country. They talk about issuing a hold-departure order against the boyfriend. Only the court can issue an HDO, now called Precautionary Hold-Departure Order (PHDO). The Supreme Court last August 17, 2018 struck down a DOJ circular that authorized the secretary of justice to issue an HDO and a watch-list order (WLO). A criminal charge in court has to be filed against Tiu before prosecutors can ask for a PHDO. The DOJ can issue instead an ILBO or Immigration Lookout Bulletin Order but such an order cannot stop him from leaving the country. Public officials or private citizens with a PHDO may still leave the country with the permission of the court and under bail. The bail is separate from that filed by the accused against whom a warrant of arrest has been issued. The ban on HDOs and the defunct WLO was imposed by the SC after the high court declared as unconstitutional the DOJ circular (#41 of 2010) that authorized the order against former president Gloria Macapagal-Arroyo from leaving the country. The DOJ circular violated the right to travel, said the SC. If no criminal charge is filed against Tiu regarding the Ashley tragedy and thus no PHDO is issued against him, DOJ may still issue an ILBO but that won't bar him from leaving the country if he decides to do so.